J.B. PENNINGTON (pictured above) had a great week as they won the Blount County Tournament. They first defeated Southeastern 7-4. The Tigers took an early lead scoring one run in the first inning, three in the second, two in the third, and one in the fifth. Southeastern was unable to score until the last inning when they scored four runs. APPALACHIAN had one win and two losses last week. The Eagles crushed Greene County 18-0. Max Glaze was the winning pitcher with zero runs on zero hits and walked zero during his three innings. He also struck out seven. Appalachian came out strong from the very beginning, scoring five runs in the first inning, 11 runs in the second, and two in the third. The Eagles had 10 hits with Chase Payne and Glaze leading the offense. Payne was 2-2 with 2 RBIs. Glaze was 2-3 with 2 RBIs. Their first loss was to Southeastern (0-10) in the Blount County Tournament and their second loss was to Shelby County (0-5). HAYDEN had two wins and one loss last week in their games against Mortimer Jordan. During their first 7-3 win, Hunter Higdon pitched allowing one hit and three runs over five innings. Preston Key (3-4, 1 RBI) led from the plate. The second game took a turn for the worse as they lost 4-12. However, Hayden bounced back the next day to win big in their final game against Mortimer Jordan. Derrick Bradford was a key player in the 11-0 shutout striking out four, surrendering two hits, and walking only one during his four innings. Bradford also led at the plate (2-3, 2 RBIs). The Wildcats had seven total hits in the game. 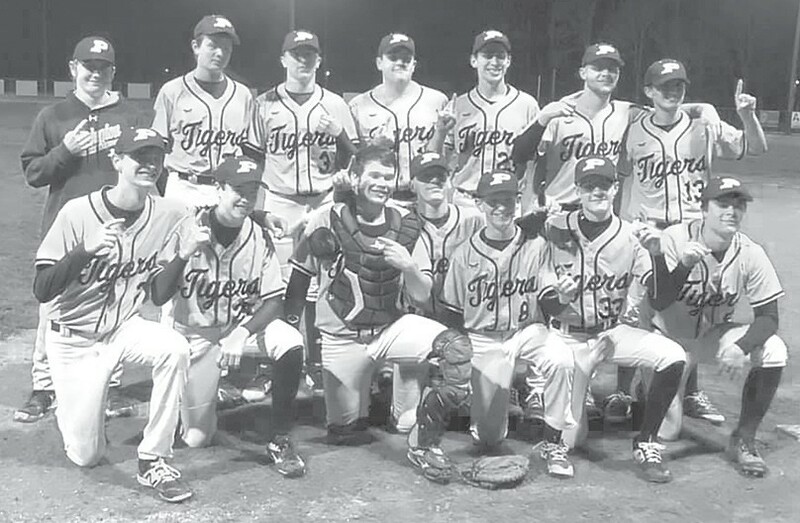 Locust Fork was no contest for the Tigers in the championship game and Pennington took the trophy after a 10-3 win. Noah Allison was the winning pitcher. He struck out 10 over five innings. The Tigers had 15 total hits. Allison, Jaxon Bullard, Jackson Millwood, Luke Cassity, Matthew Smith, and Alex Washburn had multiple hits for Pennington. Allison led with three in his four at bats. LOCUST FORK had three wins and just one loss last week. Their first win was 3-2 over Susan Moore in the county tournament. Susan Moore led the game until the fifth inning when Locust Fork tied the game at two. The Hornets scored one run in the sixth inning. The Bulldogs were unable to score in the seventh and the Hornets won. Chase McDaniel was the winning pitcher. He struck out three, walked zero, and allowed 12 hits and two runs over seven innings. Braden Ellison was 2-3 from the plate to lead Locust Fork to victory. Their second tournament win came over Cleveland 9-4. The Hornets scored seven of their runs in the fourth inning. Lukas Huber earned the win on the mound. He surrendered nine hits and struck out five during his six and a third innings pitched. The Hornets had 12 total hits. Kannon Blalock, Gavin Payne, Huber, McDaniel, and J.M. Whitehead all had two hits to lead from the plate. The Hornets ended their tournament with a championship loss 3-10 to Pennington. Locust Fork finished their week with an 8-5 win over Susan Moore. They had 13 total hits. Micheal Mullins, Payne, Huber, McDaniel, and Whitehead all had two hits to lead Locust Fork. Tucker Massey was the winning pitcher. He allowed one run on four hits and struck out eight and walked one during his six innings pitched. ONEONTA began the week with a tough 1-0 loss to Guntersville, but finished with a pair of wins. Their first win was against St. Clair County. Oneonta led the game 1-0 at the top of the seventh when St. Clair County scored one run to tie the game. The Redskins bounced back and scored to win the game 2-1. Daniel McCary pitched six innings surrendering zero runs on three hits while striking out nine. Will Moye led at the plate 2-3. Oneonta found revenge against Guntersville in their next win beating them 9-5. Austin Nix and McCary had three hits to lead the Redskins to victory. APPALACHIAN was slow to get things moving against Ragland, but after scoring four runs in the fifth inning the Purple Devils were unable to make up the deficit. Ashley Whittington, Reilly Lancaster, and Gracey Gulledge all had one hit each to lead the Lady Eagles to a big 6-3 win. 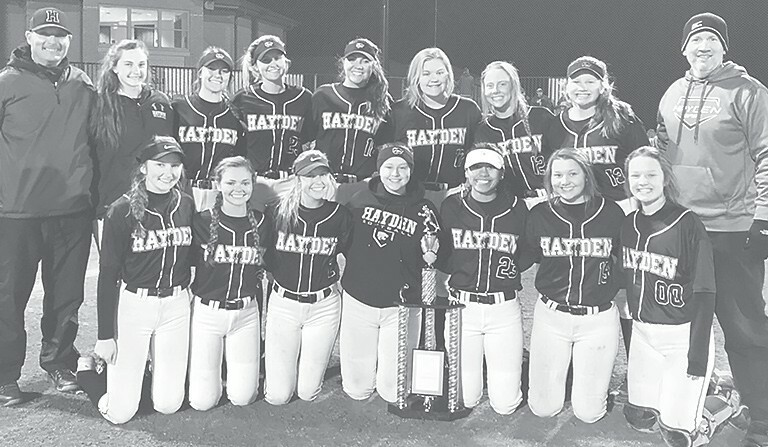 HAYDEN’S Lady Wildcats continued to dominate in their multiple wins last week. They improved their record to 12-1 beginning with a 16-2 win against Cullman and a 10-0 win against Dora. The Lady Wildcats swept the Times Daily Classic to bring home the tournament championship (above). In a span of six games they scored an impressive 51 runs while only giving up four. The weekend began with a 7-0 victory over Deshler behind the strong pitching of Hannah Cox and Savannah Painter. A competitive 4-1 victory over Pisgah and four shutouts (Brooks 10-0, Lauderdale County 3-0, Russellville 12- 0, Mars Hill 15-0) behind strong pitching and hot bats led the team to a tournament championship. Savannah Woodard had multiple great plate appearances, including two home runs. The team was ranked number 2 in 5A in AHSAA high school rankings released last week. SUSAN MOORE began their week with two losses. The first was a 2-8 loss to Glencoe. The second was against West End. It looked to be a win for the Lady Bulldogs, but ended with a 4-5 loss. The Lady Bulldogs were ahead 4-3 in the bottom of the seventh when West End singled and scored two runs. Haley Lang led Susan Moore (3-3, 3 RBIs.) Susan Moore ended their week at the Oneonta Invitational. The larger schools were too much for the Lady Bulldogs and they were defeated by Trussville (2-14), Munford (2-5), Brookwood (1-11), and Oxford (1-7).